Setting the scene was P.Ramakrishna (Rama), CEO, CIO Academy Asia. Rama emphasised the need for organisations today to develop business agility to respond to shifting consumer demands and engage new interactive touch-points. This is where data plays a critical role in defining the new competitive edge. With the rise of the four tech superpowers – Mobile, AI, IoT and Cloud, organisations are better able to capture data and generate actionable insights from regular business operations. Citing an e-commerce platform specializing in racing bicycles, online interactive features now allow customers to personalize their bicycles and have it delivered to their doorstep within a week. “The needs of customers today must be addressed at a level of granularity that requires companies to rethink their business operations, in a way that builds speed and scale” said Rama. Challenging the group of 20 odd CIOs, Rama illustrated the tension between addressing operational issues and creating business value as a unique ‘tug of war’ where CIOs have to achieve a win on both sides! Khor Chern Chuen, Managing Director for SAP Asia, gave a warm welcome and shared SAP’s vision to help its customers leverage transactional data and drive innovation. With 77% of the world’s transactions happening on SAP, it is only a natural step-up to harness the wealth of data being captured to help companies become more agile in addressing market needs. Insights drive market leadership, Next-Generation ERP gives CIOs the Edge! Deep diving into SAP’s next generation ERP capabilities was Lagnajit Patnaik, Solution Director, SAP S/4HANA, SAP Asia Pacific and Japan. Providing a historical analysis of how business transactions have evolved, Lagnajit pointed out that seeing more automation, business transactions have moved from high-touch bulk orders in the 90’s to low-touch ERP models in the 2000’s. Smaller order sizes with customised specifications can now be transacted at scale. Today, achieving zero touch and delivering highly customised products at the granularity of 1 unit for 1 customer is no-longer a dream but a reality, thanks to the high-speed connectivity and hyper-automation offered by SAP’s cloud-native S4/HANA. Built from the ground up, S4/HANA is a cloud-native next generation ERP with 8,000 customers on-board and 1,600 already deploying live workloads on the platform. S4/HANA has since produced a series of success use-cases with enterprise customers globally. They are transforming ERP as we know it, from a ‘system of record’ to a ‘system of engagement’, providing real-time insights, thus introducing a new dimension of simplicity to aid businesses in transitioning to the new platform. 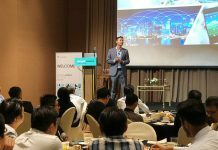 Continuing on the topic of leveraging business data for tangible bottom-line impact, presenting the next keynote was Lars Droste, Director, Cloud Solutions, APJ, Center of Excellence, SAP Cloud Platform. The end-result of successful transformation is always a pretty picture, but getting there isn’t exactly a highway of roses! As the average enterprise owns 60 or more back-end systems and spends most of its budget ‘keeping the lights on’, Lars dealt quickly with the elephant in the room: How do CIOs develop a low-risk, high-results approach to transforming the organisation while business continues as usual? We often like to relate this to an analogy of changing the tires while the car is still on the move. Needless to say, it is easier said than done! Adopting the ‘Minimal Viable Product’, or MVP approach, seems to have proven successful for customers that SAP had partnered with. Originally an approach developed by Silicon Valley start-ups hungry for venture investments the MVP approach simply refers to quickly developing a small pilot project with little resources, and then producing a working prototype for stakeholders to provide feedback on so an improved iteration could be developed. Applying this approach to complex enterprise systems, Lars introduced how SAP’s Platform-as-a-Service (PaaS) offering on S4/HANA could greatly facilitate the process of developing an MVP on top of existing ERP systems, gathering feedback and incrementally scaling intelligent ERP deployments on a tight feedback loop with business users until the new ERP is sufficiently robust to take on workloads running on existing systems. Lastly, Lars provided a birds-eye view on SAP’s partnerships with Google Cloud Platform, Amazon Web Services and Azure on a service SAP hopes to strengthen – Big Data-as-a-Service. Leveraging SAP’s strong partnership ecosystem and its wide range of customer interactions. SAP has also curated business templates to help CIOs quickly operationalise new innovation roadmaps to take advantage of cutting edge technologies such as IoT, Machine Learning and Blockchain. 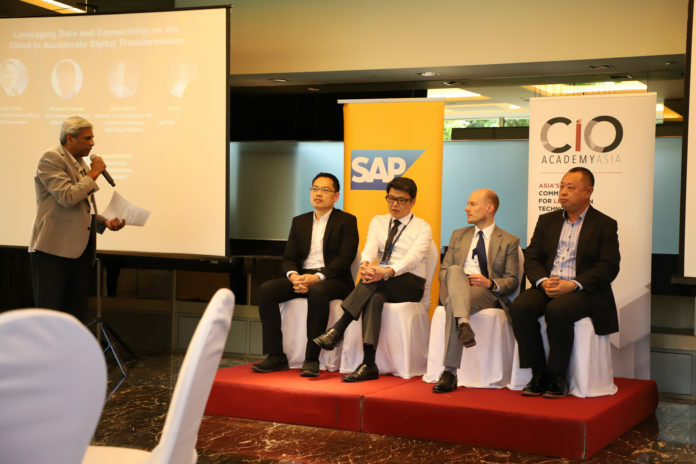 Taking the data conversation deeper is Melvin Wong, Director, SAP SEA Innovation Office. Like it or not, business users have become increasingly impatient when it comes to accessing information, especially on critical data points that hold the potential to make a dent on the bottom-line. Static dashboards providing pieces to a puzzle are not designed to tell a story and generate actionable data insights. Artificial Intelligence, or AI, today enable correlation of multiple independent data-points and provide deeper analysis on business data, delivered right to our pocket mobile devices. With intelligent chatbots, new data-points and meaningful insights are generated within seconds at the command of a person’s voice. Not only are AI-enabled chatbots responsive to complex voice commands, chatbots parse together information based on the context and relevance of each voice command based on the questions before. Such capabilities are now enabled on SAP’s platform since its recent acquisition of ReCast AI, an AI start-up that boasts cutting edge capabilities in conversational Natural Language Processing (NLP). On the panel were industry practitioners Jacob Tong, Group CIO at Keppel and Brandon Phuan, CIO at ASM International. SAP keynote presenters Lars Dorste and Melvin Wong joined the panel as well. First to respond was Jacob, who outlined the diverse sectors in which Keppel had commercial operations. From offshore marine infrastructure to logistics and data center services, the diverse business portfolio sharply increase complexities in managing the group’s technology needs. Apart from ensuring smooth and cost-efficient business operations, Keppel places high importance on being alert to industry disruptions happening across its competitive interests. This served as an impetus for change, and thus challenged Jacob and his team to develop a strong digital strategy to ensure Keppel’s longevity across the group’s businesses. 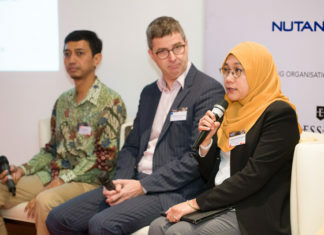 Jacob also emphasised that in introducing new technology, it is critical to simultaneously educate both his board stakeholders and business managers on his digital agenda for the company, so that key decision makers are aligned and supportive of the business value that Jacob’s technology investments seeks to add. Jacob sees many ways that data analytics could help optimise processes within Keppel Group. Contextualising the application of data analytics to different functions, Jacob illustrated an example of how predictive analytics could aid his finance counterparts in identifying a potential credit crunch and start negotiations with banks early. Brandon further averred on Jacob’s point on leading strategic change management as part of the organisation’s digital transformation journey. ASM had consolidated into a centralised organizational structure and had previously solidified its technology blueprint. This resulted in significant inertia for the organisation to accept changes to its existing ERP systems. To coordinate the geographically dispersed ERP transformation effort and prioritise business process changes on its ERP platform, existing transactional data offered clues to guide ASM’s ERP transformation strategy. 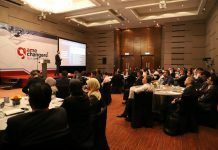 Themes around “building the right enterprise architecture” surfaced as a key priority agreed upon by the industry practitioners and SAP’s tech experts. To reap the benefits of any early forays into the world of data-analytics, organisations have to ensure the right systems and processes are in place in a way that facilitates data sharing and allows MVPs to be developed without affecting mission critical operations. Before wrapping up the panel session, Carlos Galiano, CIO for Seaco, a global container shipping services company, discussed the dichotomy between managing costs and driving business value with new technology innovations. To this, Brandon cited his past experience in working with a business group that was comfortable capitalising on market inefficiencies and milking its cash cow without considering the possibilities of potential disruptors that might quickly erode market share. 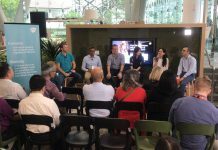 The panel ultimately agreed on the importance of providing meaningful data-driven insights to help their business counterparts better understand the market forces acting around them. They can therefore take on proactive strategies to capture new opportunities or widen competitive moats before allowing the digital agents to facilitate the transformation of business through technology. Rama has been involved with the ICT domain for the public sector for more than 30 years. Rama was formerly with Singapore’s Infocomm Development Authority (now IMDA and GovTech), his last held position was Director of IDA’s Industry Development, responsible for national level initiatives to develop the ICT industry ecosystem. He has provided advisory services to develop ICT masterplans for foreign governments in several countries. 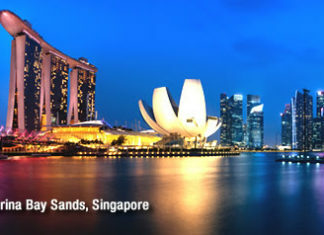 Rama is the Deputy CEO for CIO Academy Asia, building communities and sharing insights with tech and business leaders. As part of his role at CIO Academy, he has hosted many distinguished C-level leaders from global technology companies. Rama is also the co-author of the recently published ‘Intelligent Island: The Untold Story of Singapore’s Tech Journey’ which chronicles the development of Singapore’s tech industry.